One-story 3/2, 2-car garage. This beautiful home offers a double door & covered entry, open-style floorplan w/vaulted ceilings, neutral tile flrs, upgraded lighting, formal living & family rm w/glass doors & views to covered patio & private fenced backyard oasis. The master offers large expanses of glass windows, walk-in closet & m.bth w/ designer neutral tile, bidet & soaking tub. Kitchen is spacious w/counter bar. Laundry closet equipped w/washer & dryer. Garage currently used partially as an office. 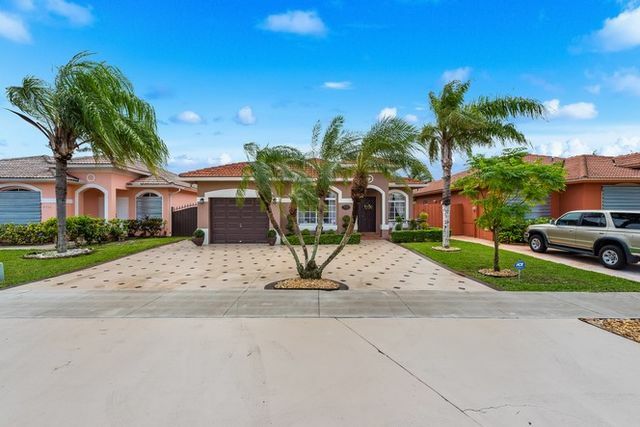 7970 NW 200th Ter, Hialeah, FL 33015 is a 3 bedroom, 2 bathroom, 1,545 sqft single-family home built in 2002. This property is not currently available for sale. 7970 NW 200th Ter was last sold on Feb 6, 2013 for $232,500 (46% lower than the asking price of $339,900). The current Trulia Estimate for 7970 NW 200th Ter is $463,390.